What do our bees do in winter? Last summer Verdicchio Ristorante welcomed new members to its team, honey bees. With the help of Lively beekeeper Bob Dewar, we installed two hives on the rooftop of our west end establishment. We started with 10,000 bees per hive and by the end of summer, the population was thriving and… producing honey! We harvested four pounds of honey in our first season. We used the honey as an ingredient in our kitchen, added it to desserts and cocktails. Our supply sold out quickly at My Mother’s Place . If you were one of the lucky ones who snagged a little jar, you would have noticed definite aromas of clovers and dandelions. It’s easy to understand why; gazing down from the rooftop, clovers and dandelions colour the landscape as far as the eye can see. But soon enough snow would blanket that landscape. We had to put our bees to bed before the first frost. Did you know that honeybees don’t hibernate during the cold months? Yes, even in Northern Ontario. To prepare our bees and their hives for the winter, we had to ensure they were protected from snow, wind and cold, and had enough to eat. We did this by removing the “supers” from the top of the hives. This would ensure the bees remained in the lower compartments for warmth and food. We left the combs in the hives to provide enough nourishment throughout the winter months. But before the hive was insulated, we checked on the colonies, ensuring they were healthy and the queen bees were alive. 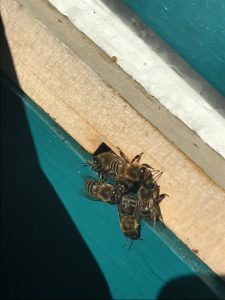 We were relieved to locate Queen of Kelly Lake and Queen Meadonia (yes, we named them) and proceeded to wrap the hives with a corrugated winter wrap, placed medication to prevent mites nearby and ensured proper ventilation. 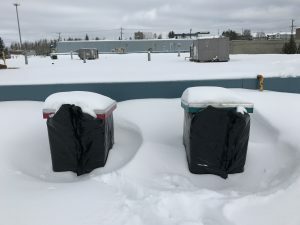 Because of our extreme climate in Sudbury (snow, rain, wind, repeat! ), we added an extra foam insulator. Fast forward to February, the time of year when their food supply diminishes. On Feb. 24, Mark Gregorini, our wine cellar manager and resident beekeeper, climbed the fire escape to check on the hives. It appeared some of the bees were trying to break through the top foam insulator – a definite sign they were hungry and searching for food. Some of the bees were dead, which, sadly, is normal. A five to ten per cent loss is typical during the winter months although it’s not uncommon for half of colony to die during this time. To ensure the existing population thrived, Mark fed them sugar syrup and he will continue to do so until spring flowers can produce the pollen our bees need to thrive and begin producing honey again.